Welcome to my fifth post for the Five Photos, Five Stories Challenge. I was invited by Terri from https://terriwebsterschrandt.wordpress.com/ to participate in this blog series. So for the last installment in this blog challenge, the biggest challenge for me was which item(s) to use in this last post… my grandparents were hoarders, or perhaps if I’m charitable, collectors of everything. I have the collecting bug also, so I understand the desire to keep. I have my collecting bug for the most part balanced with my need to keep an uncluttered home and my desire to pay for my holidays. 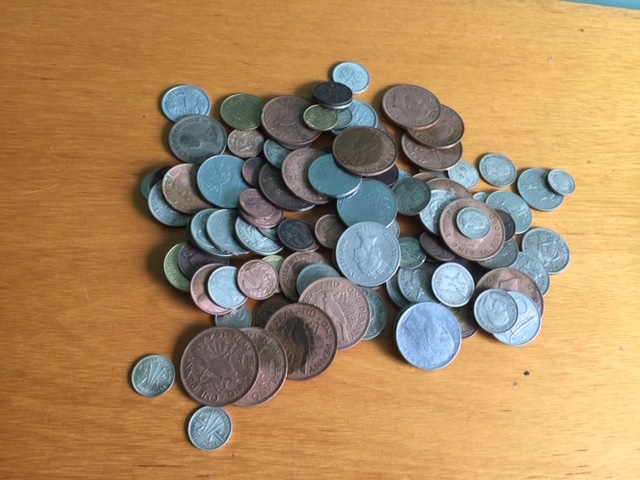 So when I inherited their coin collection, I hoped it would provide some interesting research, and perhaps some valuable coins, which when sold might pay for my next trip away. Firstly the coins had oxidised badly, you can see on some of the coins in the photo imprint of other coins. I had to carefully prise them apart in order to clean them. Once I was sure there weren’t any obviously valuable coins, I soaked them in vinegar and scrubbed the green mould off them. Worthless! Just your basic circulated change. There were a handful of old New Zealand florins and half crowns which I did manage to sell online for about $5 each. They would have been better putting them in the bank and earning interest on them. Many was obviously coins that had gone from circulation that they kept. But goodness knows where they got some of the foreign coins from, as they had never been to half the countries represented. I would like to invite Tvor from https://tvortravels.wordpress.com/ to join this challenge. As I said, it is totally up to each individual to accept whether they wish to participate. There maybe a crafter around who is looking for coins to add to jewelry. Most of the time there is someone out there looking for “X”. The Internet makes the world a smaller place. Believe me, I understand. My dad was a boarder line hoarder. Many people, close to literally, dug him out of the house, for the span of a year. Not every persons junk is another person’s treasure. Sometimes another persons junk is just junk. They kept old phonebooks, plastic container lids and stuff that my Dad remember’s throwing away when he lived at home. I think the saddest thing was finding the brand new, in package toys that had obviously been purchased for me, my brother or cousins and we never got them – they were probably “too good” to give away.